What Drives an Astronaut to Strike? Astronauts work incredibly hard, putting in long hours in unnatural, difficult conditions. But sometimes they get pushed too hard, and reach a breaking point. 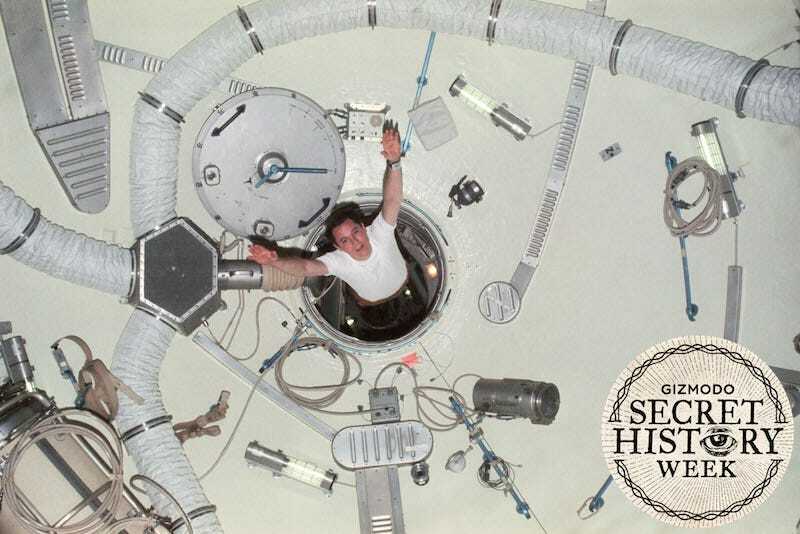 This is the story of Skylab 4, the astronaut crew that kicked off the holidays with a mutiny. The mission launched on November 16, 1973, captured in this retro-futuristic moment as the Mobile Service Structure left these streaks of light as it pulled away from the rocket. The crew of Skylab 4—Gerald Carr, William Pogue and Edward Gibson—were all space-rookies at the start of their 84 days in orbit. Like their predecessors on Skylab, the bulk of their time was devoted to scientific experiments including observations of comet Kohutek and the first recording of the birth of a solar flare. But unlike previous crews, they fell behind schedule and got into quarrels with Mission Control. December 23, 1973: Gerald P. Carr tests the Astronaut Maneuvering Equipment M509 Experiment in the forward compartment of the Orbital Workshop. Image credit: NASA. The astronauts claimed NASA was demanding too much; ground control countered that the rookie crew should be working through meals and scheduled breaks to catch up. The astronauts requested time off; ground control was horrified and confused, citing the request for time off as signs of lethargy and depression. Edward Gibson at the Apollo Telescope Mount console. Image credit: NASA. You have to put away equipment, you have to debrief, and then you have to move from one position to another, and you have to look and see what’s coming up, and we’re just being driven to the wall!… There’s not enough consideration given for moving from one point in the spacecraft to another and allowing for transition from one experiment to another… When we oppressed bodily from one point in the spacecraft to another with no time for mental preparation, let alone getting the experiment ready, there’s no way we can do a professional job! Now, I don’t like being put in an incredible position where I’m taking somebody’s expensive equipment and thrashing about wildly with it and trying to act like a one-armed paper hanger trying to get started in insufficient time! Six weeks into the mission, the crew broke: They declared an unscheduled day off, turned off their radios, and took the day to shower, stare out the windows, and relax. February 3, 1974: Edward G. Gibson during the last of four extravehicular activities by the Skylab 4 crew totalling 22 hours, 13 minute of spacewalks. Image credit: NASA. After the strike, Commander Carr renegotiated a work-schedule with ground control: “We need a schedule that is not so packed. We don’t want to exercise after a meal. We need to get things under control.” The crew were to be left alone during meals, and no strenuous work would be scheduled after 8 pm. Routine chores would be placed on a list for the astronauts to pick off at their convenience instead of on a rigid schedule. The truce had consequences: with more rest and higher morale, the astronauts were more productive. But they also were no longer trusted, andonce the mission ended none of the trio ever flew again. February 1, 1974: Edward G. Gibson and Gerald P. Carr look up the airlock module passageway while taking out the trash. Image credit: NASA. The average workday for a modern astronaut in orbit reflects these hard-won limits on working time. It starts at 6:00 am with a morning inspection of the station, followed by breakfast and a planning conference with Mission Control. Scheduled work starts just after 8:00 am, going through 1:00 pm with a break for lunch. Then there is exercise and more work until 7:30 pm when the astronauts break for dinner and a debriefing. It’s bedtime at 9:30 pm, with the whole 10-hour workday beginning again in the morning—except for Saturdays, when half the day is allotted to unscheduled work-projects. The conflict between the ground control and crew of Skylab 4 also led NASA to reconsider conflict resolution strategies for long-duration spaceflight. February 8, 1974: A final fly-around of Skylab before the crew’s departure. Image credit: NASA. This wasn’t the only space-mutiny: the crew of Apollo 7 went on strike after all three caught colds in orbit and refused to obey ground control. The last strike was when a Mir crew refused to complete a sixth spacewalk inside of two months to complete non-essential repairs. Considering how independent astronauts are, how rough the space environment is, and how much science bureaucrats want to squeeze out of every expensive mission, it’s a wonder mutinies have been so rare. February 8, 1974: The crew of Skylab 4 relax on their recovery ship USS New Orleans after splashdown. Image credit: NASA.